The SRT is an extraordinary trail, notable for expansive views across the entire ridgeline, cliffs and rocky outcroppings of white quartzite conglomerate, and rare dwarf pine barrens. SRT starts at High Point State Park in New Jersey, where it intersects with the Appalachian Trail. At the base of a 200-ft tall obelisk honoring war veterans, you can look north and see the Shawangunk Ridgeline stretching out 50 miles in the distance -- that's where you will end up. The SRT proceeds through rolling forested hills, passes next to the Bashakill wetlands, and cuts through the small town of Wurtsboro, before ascending the ridge again in the Wurtsboro, Roosa Gap, and Shawangunk Ridge State Forests. After descending from the heights along an abandoned roadway, the SRT next climbs the steep but spectacular South Gully trail to reach Sam's Point, and then it heads past two sky lakes and into the rocky heights of Minnewaska State Park and the Mohonk Preserve. In these areas, the SRT takes winding, rocky, technical trails, and includes a couple of squeezes and scrambles, before ending up on a paved road, route 6, for a steep downhill into the Wallkill Valley, where a rail trail takes you to the end point at the restored railway trestle over the Rondout Creek in Rosendale, NY. Total distance is 74 miles according to the NY NJ Trail Conference. My Suunto Ambit 2-R clocked the distance as closer to 80 miles. I will post more detailed notes and pictures on the facebook page to aid runners and hikers who would like to explore this important trail. I thru-ran the 74-mile Shawangunk Ridge Trail again on July 3-4, 2015 and improved my time to 24 hours 8 minutes. This was on an unsupported basis. This route is different from the run I did last year as it incorporates a trail through the Mohonk Preserve that bypasses the paved roads and rail trail. We will use this variation for the race in September (www.srtrunhike.com) and it will likely become eventually the official route of the SRT once certain land access issues can be worked out. As always the SRT is a special experience. High points included the views at the start, beautiful weather on Friday, seeing two bears, improved markings in the southern Gunks, views from the ridge at night. Low points included missing a couple of blazes at night, thigh-deep water on the Bashakill trail, and getting tired of roots and rocks. I'm pleased to report that we have a new unsupported FKT for the Shawangunk Ridge Trail (SRT). Jason Berry was the first place finisher at this year's SRT Run/Hike (www.srtrunhike.com), a minimalist format event that is totally unsupported (no aid stations or supplemental course markings) and was created specifically to provide an unsupported FKT experience on what we believe is one of the most beautiful and rugged trails in the northeast. Jason completed the entire SRT in 22:02, improving upon my previous record by over 2 hours. Nice job Jason! Last year's SRT Run didn't produce an unsupported FKT because we put out water (this was due to drought watch conditions). This year, zero aid was provided, and we have a new course record and a new unsupported FKT for the 70-mile Shawangunk Ridge Trail. 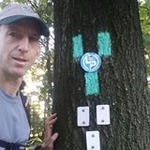 Timothy Ela of Clifton Park, NY completed the trail in 19:17. The SRT Run is a minimalist format event, so no aid stations (although we do have check points for safety), and no supplemental course markings. It uses the "new" SRT route which goes through the northern Mohonk Preserve instead of on roads and rail trails.